Just to keep it real... I should have written this post 3 days ago... THREE days ago! But I'm behind. I think my goals for next year will include sticking with my deadlines! I will write down three things I am thankful and grateful for every day. I will take a short 15 minute walk outside at least 2 times a week, both for letting go of stress and to encourage myself to exercise more. To help with our budget this month, I will not buy anything new (used or thrift store items okay) for myself. 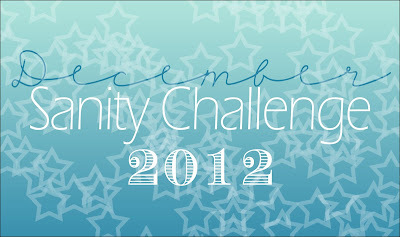 See Leo Babauta's challenge this week for my inspiration to do this for the remainder of the year... and I would like to pursue this in 2013 as well. I have to admit, I didn't do very well at keeping them. I started off well. The first week went swimmingly, but after that, the goals were kind of left to the wayside. Out of all the goals, the one I probably had the most success with was not buying new things for myself. I did end up buying three things over the course of the month and a few e-books, which I didn't even think about as "things" until after I bought them... but overall I put off a lot of impulse purchases and that was the primary goal of my my personal financial challenge! However, what did happen over the month was that I re-examined my thoughts on a peaceful holiday. What did it really mean? What were the things that stressed me out? How could I avoid those things? I let go of perfection -- Usually I wrap all gifts, do all the shopping, and I can stress myself out by trying to make it perfect... this year I asked for help, I asked husband to help, I asked him to wrap and to purchase/decide on quite a few of the gifts. I let go of making sure it was perfect. I made time for the one holiday tradition that I truly enjoy doing, Holiday Cards. -- I love writing them and sending them and I always make sure to write a note inside each of them to make them personal and that was important to me. So I spent a lot of time writing those cards and sending them... in years past I've put it off because I Felt like other things had to be perfect... so I let go of that and did what I enjoyed. I let go of expectations. -- I think most often I am disappointed when I expect something and it doesn't happen. And the holidays can be a major time of disappoint and frustration. So this year, I expected less and simply enjoyed the time. And it was a much more enjoyable holiday! I do wish I had spent a little more time working towards my initial goals, but I still feel good about how the holiday went and I feel it was a peaceful and enjoyable time. I appreciate this challenge not because it "requires" you to follow the goals you set, but it puts you in a better frame of mind. It helps you to think of things differently overall and have a most positive experience. Cheryl is offering a $50 Nuts.com gift certificate and I am giving away two brand-new signed copies of my "The Everything Gluten-Free Slow Cooker Cookbook" after our monthly event is over. From Cheryl: "Last, but not least, we do have a FB group – if you’d like to join, you’re more than welcome. It’s a space to support and be supported, and it’s the same one we used during our last Self-Care Retreat." Good for you for letting go of perfection and asking for help! Those are big ones. Thanks so much for sharing, Carrie. Sounds like things didn't go the way you envisioned but things worked well in a different way, and that's a valuable one. I can totally relate! It seems you learned a lot this December. Letting go of expectations is something I've been working on for a while. It really helps. I'm so glad I learned about the challenge through you; while I didn't meet all of my goals either I really did learn a lot. Unfortunately I have had a flu bug kicking my rear end for the last several days but hope to be able to post my thought in another day or two. Happy New Year.